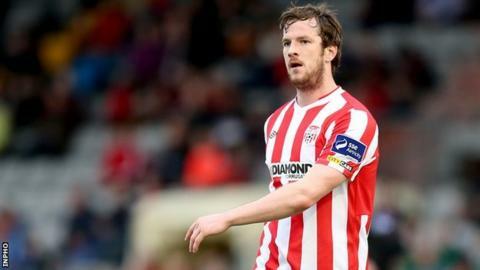 Derry City recovered from a goal down to beat 10-man Sligo Rovers 2-1 thanks to headed goals from centre-backs Ryan McBride and Aaron Barry. Eamon Zayed put the visitors in front with a thumping effort into the bottom corner in the 26th minute. McBride found the net with a glancing header two minutes from the break, then Barry headed in his first goal for the club early in the second half. Danny Ledwith was sent-off for a second bookable offence late on. Ledwith was ultimately dismissed for a foul on Dean Jarvis, while Derry manager Peter Hutton was also sent from the dugout in the dying minutes. The hosts began the game brightly, with Philip Lowry toe-poking the ball over the bar, Patrick McEleney going close with a free-kick and Jarvis shooting across the face of goal. Ex-Candystripes player zayed broke the deadlock against the run of play with his second goal for his new club. Barry McNamee blasted over after good work by Jarvis and then Richard Brush saved Patrick McEleney's penalty after the Derry player was adjudged by referee Dave McKeon to have been fouled by Kalen Spillane inside the area. Before the interval, McBride rose to meet McEleney's delivery for his third goal of the season and his third against Sligo. Full-back Ledwith was then dismissed and in the closing seconds, Ger Doherty saved from Evan McMillan and Stephen Dooley followed up to prevent a certain goal.